AMU Engineering Entrance Exam (एएमयू इंजीनियरिंग प्रवेश परीक्षा) 2018: This is the common entrance examination which is conducted by the Aligarh Muslim University (AMU). The University conducts this examination every year for the B.Tech Admission. The AMUEEE Notification has been announced and the AMU engineering entrance exam 2018 will be conducted in April 2018. The interested and eligible candidates can apply for the AMUEEE Application Form 2018. The form can be submitted only before the due date. For appearing in the entrance exam, candidates have to carry the exam hall ticket and they will be able to download it in the last week of April 2018. All the necessary details concerning the AMU EEE 2018 are shown procedurally below. You all are advised to follow the complete details for becoming familiar with the complete details of AMUEEE 2018. Every candidate has to fill the AMU Engineering Entrance Exam Application form on or before the application submission deadline. Candidates who have successfully applied for the AMUEEE will be invited to appear in the entrance exam that will be conducted in April 2018. The students have to submit the form on or before the due date. Following are some simple steps to apply for the online application form. Steps to submit AMUEEE Application Form. Candidates have to click on the official link of the university. Then Download the application forms PDF and take a printout. Pay the application form fees by internet banking, Debit & Credit card or by the bank challan. And Submit the application form to the given address. All the applicant who applies for this entrance examination for them must have to meet their eligibility criteria for the entrance examination. If the applicant is eligible than only the applicant is allowed to fill the entrance exam. 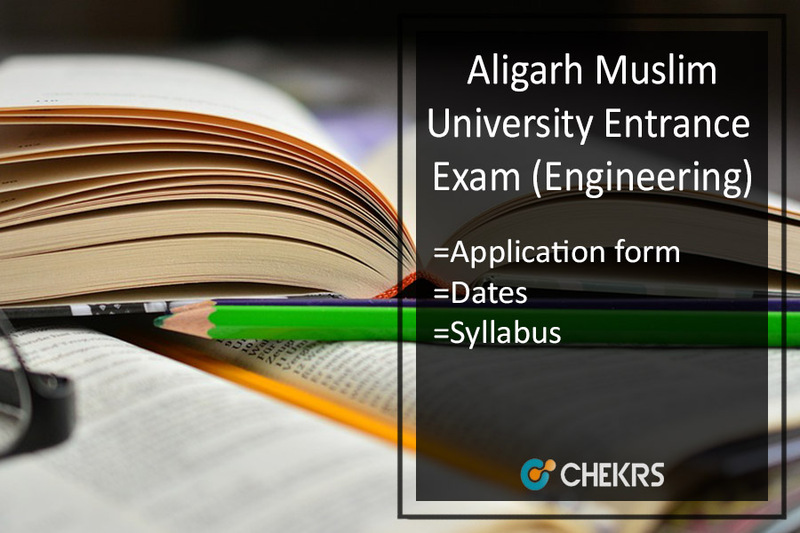 Following are the Eligibility Criteria of the Aligarh Muslim University Engineering Entrance Exam. Candidate should have to pass their SSS Certificate Examination of Aligarh Muslim University or from the equivalent examination. Applicant has to pass Senior Secondary School with minimum 50% of marks in Physics, Chemistry, Mathematics and also English. An applicant who passed their Diploma in Engineering with Aligarh Muslim University minimum 50% marks that applicant also the eligible for the entrance examination. Age Limit Applicant who applying for the entrance examination maximum age limit is 24 year. An applicant who is applying for the AMU Engineering Entrance Exam they can refer this important date which is given as follow. Here applicant will know about the programmers which are offered by the university to the eligible applicant following are the Programmers offer by the University. Following are the entrance examination center of Aligarh Muslim University Engineering Entrance Exam. Eligible Applicant who applying for the AMU Engineering Entrance Exam they all needs the examination syllabus for their studies. The AMUEEE Syllabus will help them to cover each and every topic of the exam. The aspirants will be able to score good marks in the exam. Through the examination syllabus applicant will know the AMUEEE subjects. Following are the subject of the AMUEEE examination given below. Through the examination, Sample Paper of AMUEEE applicant can score good marks in their entrance examination. Sample paper also helps fully for the applicant to know in which subject they are comfortable. Exam paper pattern will help to the applicant to know the each subject weightage. The examination paper pattern very uses full for the applicant to score good marks in their entrance examination. Following are the AMU Engineering Entrance Exam Pattern is given as follow. Total Questions: 150 questions (PCM). The applicant will get the AMUEEE 2018 Hall Ticket from the official website of the university in the last week of April 2018. Candidates have to carry the hard copy of the admit card in the examination hall along with a valid photo ID proof. The entrance exam will be conducted at its various exam centers on April 2018. Through the admit card applicant will know the entrance exam center and the examination center. Applicant able to download their-their Admit card on before the examination day. The applicant only allows entering the examination center for they must have the AMUEEE Admit Card 2018. The applicant will get their AMU engineering entrance examination result after 20 to 30 days of the exam conduction. The entrance exam will be conducted in April 2018 and hence we are predicting that the AMU EEE 2018 Result will be declared by the last week of May. after given the AMU Engineering Entrance Exam. Applicants get their examination result on the official website of the AMUEEE. After getting the entrance examination result applicant will know whether he/she fit for the B.Tech programmers. The AMUEEE is commonly conducted by the Aligarh Muslim University (AMU). The University has been conducting this entrance examination for the undergraduate applicant for the B.Tech programmers. An applicant who wishes to apply for the AMUEEE 2018 they will have to meet their eligibility criteria or whole the process to apply for the Entrance examination. Every year the thousand of the applicant applies for the Aligarh Muslim University Engineering Entrance Examination. This year the AMU Engineering Entrance Exam will be conducted on April 2018. For any type of queries about any of the events regarding the AMUEEE, candidates are invited to contact us by commenting at the end of the post.